When Prime Minister Najib Razak rolled out the much awaited Bajet 2018 last week, many, including PwC, touted it as a budget for the people. With RM1.7bil allocated for the ageing population and people with disabilities, RM6.5bil for rural area development in East Malaysia, a few toll booths being abolished, and reduced tax rates for middle to lower income households; it’s hard to argue otherwise. As a young Malaysian millennial, the topic of working income, financial planning, side hustles, and buying a home has become a staple whenever I meet with friends at the mamak. (Or bars when I somehow manage to collect enough change for a pint). Yes, budgeting is no doubt a hot topic for the average young Malaysian so we got 6 millennials in KL to share their own personal budgets in 2017, and what they hope to improve on for 2018. My current salary is in the range of RM3k-RM4k. I hope to save enough money to invest and put away an emergency fund, and ultimately to buy a house. Additional income through promotion at work or investments will be channeled to upgrading my lifestyle. My guilty pleasure? Clothes. RM200 a month worth of clothes. It’s not a large sum, but it adds up to a lot. I currently take home RM1.5k a month. Having just passed my Certificate in Legal Practice, my salary will increase to RM2.5k as a Pupil in Chambers. Soon I will be starting to pay my own rent, as it was subsidised by my brother before this. With the extra income, it will most probably go towards contributing back to my parents. For 2018, I hope to spend less on petrol by finding a place closer to work and taking the public transportation more often to free up cash to pay for other expenditures. Depending on the month, I earn between RM2.5k-RM4k per month. I am saving up to buy a home and for my travels annually. Like most middle-income earners, the scare of an emergency expenditure like car repairs, health, or having to attend 4 weddings in a month (them angpows, gasp!) makes it harder to save up. Oh, I also signed up for a twice-a-month facial package for a whole year which has put a huge dent in my wallet unnecessarily. My current salary is RM3.1k per month inclusive of allowance. The rest of my salary goes into my savings, which will be used for emergencies such as sudden dental/medical visits, traveling, and camera gear. I also love stationery! I once spent RM300 on Muji pens in a single sitting. And when I was in Korea earlier this year, I bought RM450 worth of stickers, coloured markers, pens and chalk pastels. I feel that having a car takes a lot out of my pocket, but it’s a necessity for me as I frequently travels for work. The issue of emergency spending also creeps up from time to time, which depletes my savings like a Harry Potter spell. So for 2018 I hope to increase my savings for emergency funds in 2018..
My monthly allowance is RM800. I’m saving up for traveling, workshops, art materials, reading materials, and interesting courses. It’s harder to save up for traveling these days due to the weakening Ringgit. For 2018, of course I would like to find a better job, freelance on the side, and upgrade my skills to ultimately be able to work overseas. Biggest purchase this year was a flight ticket to Hokkaido, I bought it at RM700 under a promotion. My starting pay was RM3k and I’ve recently received an RM500 increment in June. Most of my impulse spending involves signing up for random marathons which costs between RM80 – RM100, but what really spoils my budget is always making that McDonald’s Drive Thru trip after work. – Write down everything I spend weekly/daily to weed out unnecessary expenditures. – Project my spending based on previous data. From there, I will adjust how much I can spend per week. – Work smartly around credit card billing dates. If I can foresee any big spending, I’ll see how much is in my balance this month and if I can wait and charge on the next statement. – Be more mindful of credit card bill due dates (maybe setup an auto-debit) and FD maturity dates (so I could maximize on my compound interest). – Keep receipts for tax refunds. When it comes to budgeting, every cent counts. What’s the most ridiculous item you’ve spent on this year? 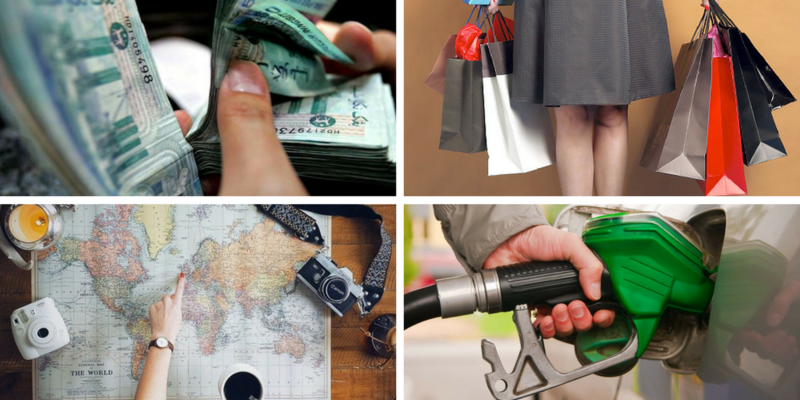 We’ve all made impulsive purchases at some point in our lives, from these 6 Millennials we know that coming clean with the things we do with our money can be quite daunting. Nonetheless, it is a good first step to responsible budgeting. With 60 days left before we enter the new year, it is a good time for us to take a long, hard look at our spending habits in 2017, and plan for a better bank balance in 2018. ** Names are changed for privacy purposes.